Hello, and welcome to my new feature, “Ten Questions With Katie.” I will be interviewing writers, whether published, indie, or aspiring. If you’d like to be next, details follow below. Today I’m pleased to welcome independent author Sherri L. Hollister to my blog. 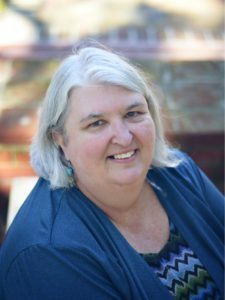 She’s the chairperson of the Pamlico Writers’ Group in North Carolina. 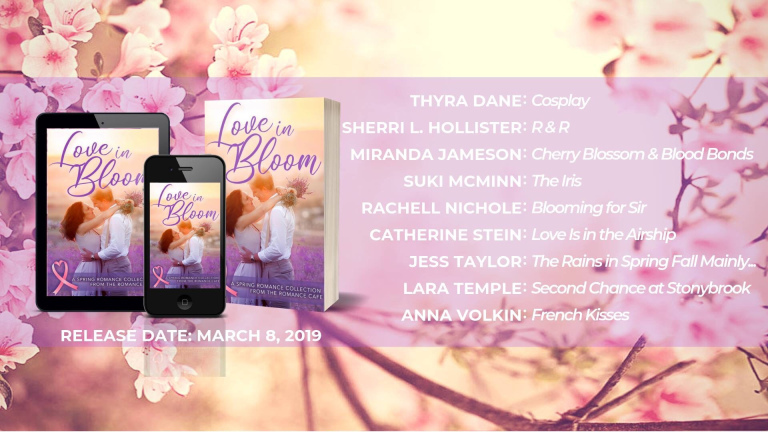 Sherri has self-published two romantic suspense books, Chrome Pink and White Gold, and contributed a short story in The New Romance Café’s spring anthology, “Love in Bloom,” available 8 March 2019. Katie: Welcome to South Florida, Sherri! Pull up a chair, grab a margarita, and tell us a bit about yourself. 1. Are you originally from North Carolina? It’s such a beautiful state! What’s your writing story? I was born in Bossier City, Louisiana, my dad was stationed at Barksdale Air Force Base. Both of my parents are born and bred Carolinians. There families going back several generations in Hyde, Beaufort and Pamlico Counties. I got to North Carolina as quickly as I could. After the Air Force, Daddy went to work in the shipyard in Newport News, Virginia. We lived in Hampton until his mother, my grandmother, died. Then he moved us home to North Carolina. No matter where I’ve lived, North Carolina has always been home. I have been a resident of North Carolina off and on for over forty years with a brief return to Louisiana, short stays in Texas, Georgia and Florida, and two stints in New Mexico. I enjoyed living in new places and found each beautiful and interesting but there’s no place like home. I am an only child. I love living in eastern North Carolina. I love the water and the feeling of being home but we have to drive forty miles to go to the movies, skating or shopping. A few years ago, we lost our grocery store and that has been a true hardship for our community. Reading, and soon after, writing became my way of dealing with the aloneness of a small community. I entertained my older neighbors with silly antics, once dressing up as Raggedy Ann in the middle of Summer and joining them for lunch wearing an ugly red-haired wig missing some of its locks, a real cloth diaper and baby booties I’d made myself. I made them laugh. I briefly entertained the idea of acting but prefer backstage to the limelight. I wrote poems and plays for church and even attempted to write a couple of songs, but my true love has always been romance. I read my first historical romance at age thirteen, Shanna by Kathleen E. Woodiwiss, and I was hooked. I kept a notebook with me nearly all the time. If I wasn’t reading, I was writing. My eighth-grade teacher called me Agatha (for Agatha Christie). I didn’t know at the time, that I would be writing romantic suspense I wonder if he was clairvoyant? Probably just lucky. 2. Early on, you entered a writing contest sponsored by the Carteret Writers, which led to your involvement with the Pamlico Writers Group. Tell us a bit about it. I recently gave a talk at the Carteret Writers Luncheon. It came to me as I was planning my talk how I’d come full circle. My best friend Robina Norman is the manager of our local library. She began encouraging me to do something with my stories besides hide them in a box. When the Carteret Writers’ contest came across her desk, she convinced me to send in a short story. At the awards dinner I met a man who was a member of the Pamlico Writers’ Group. The Pamlico Writers met at the Beaufort County Arts Council in Washington. My home is about forty minutes away. For years, I attended the Pamlico Writers’ Group with irregularity as I was raising six boys. About ten years ago, I started attending meetings with more frequency. When the Pamlico Writers put together their first conference I was thrilled. Robina had dragged me to two writers’ conventions hosted by the Romantic Times Magazine, and I’d joined Romance Writers of America and our local chapter, Heart of Carolina, in Raleigh. I enjoyed attending these workshops and meetings but couldn’t afford to go often. After the Pamlico Writers’ second conference I joined their steering committee and became more involved with the writers’ group. When the chairperson decided to step away from the group, I became the chair by default. We are a small group. This year will be our seventh annual writers’ conference. I will be hosting my first workshop, a combination of what I’ve learned by making a lot of mistakes and the classes and workshops I’ve attended. The title, “Be Prepared,” is about having information at your fingertips that will help you if you are asked to be a guest speaker or suddenly have a promotional opportunity. 3. Your books, Chrome Pink and White Gold, are both romantic suspense novels. What drew you to the genre? My house burned down and I lost all of my research books. Writing became more difficult for a while. When I did get back to writing it was with a different mindset. Then several things happened: my friend’s husband died of cancer, she gave his old motorcycle (a Harley) to my husband’s boss (her uncle), he restored the bike, and I wrote a story about it for our local paper. I also took a character development workshop online, the instructor had us describe someone we knew, and I chose my husband, David. The next day she had us change the gender, ethnicity and a few other things but keep some of the original descriptions. Rae Lynne was born. I tell everyone she’s David in drag. She came fully alive when I met one of my son’s friends. He was at a low point in his life and she and her partner took him in. She’d brought him to see us. She was beautiful, Hispanic, pierced and tattooed with a streak of pink in her hair. I asked my son about her, he told me, she’d had a rough life. Yet, even with all she’d been through, she was kind to my son, polite to me but able to hold her own in a fight. She completed my picture for Rae Lynne. I didn’t plan to write romantic suspense, I just wrote Rae’s story. What happened to make her so tough and yet vulnerable? Who are her friends and family? Then I read an article about North Carolina being one of the biggest human trafficking ports in the US and a few small-town scandals later and we have the Leeward Files. 4. Any plans to switch genres in the future? If so, what interests you? I’d love to do a spy series, a military or fire fighter series and maybe a female motorcycle gang set in the forties? I love history and would love to replenish my library but for now, I have several books planned to keep me busy. My second series will return to my Plain Janie series I lost in the fire but I’m recycling it as the Harrell Family Chronicles. It will take place in and around Leeward. It’s about a small-town librarian, Jane and her six siblings. I’m hoping for a combination of fun romantic suspense with some serious issues and family drama. I’m also planning a historical series but it still needs a lot of research before I’m ready to talk much about it. 5. 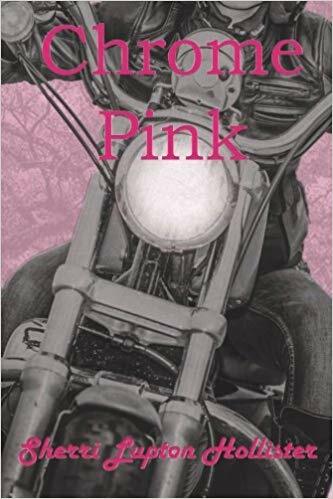 Chrome Pink offers a hard-hitting and visceral look at power and corruption in a small North Carolina town, and its effects on one person in particular – Rae Lynne Grimes. What inspired the idea for the story? The Leeward Files is about three girlfriends who survive high school in a small town and grow up to be strong, determined women. Chrome Pink is Rae’s story, she is the seed that started the stories. White Gold is her friend Dana’s story, and Titanium Blue, which I hope to have out in a few months, is Jenna’s story. I’m also working on a short story collection called “Silvered Midnight” which will be published on my website, it’s the what’s happening in Leeward that you don’t see in the novels. [Katie: I absolutely LOVE this idea!] I have also planned a fourth book with Rae’s brother, Billy, Red Steel, and a spin off book that will tie up some loose ends with a couple of weddings and a baby. 6. Who are your favorite writers? How did they influence you? Oh wow. My go-to authors are Amanda Quick aka Jayne Ann Krentz (or Jayne Castle) and Sabrina Jeffries. I’d read anything they write, even their grocery lists. I’ve never read a bad book by either of them. I think JAK, more than anyone, brought me into contemporary romance and suspense. My Plain Janie series came about while reading Janet Evanovich. I wanted to write an amateur sleuth set in the south. Jane is the local librarian with all of the stereotypical prejudices until she decides to come out of her shell. 7. Who inspires you to write? Why? Nora Roberts, Kat Martin, Tessa Dare, and more recently Deanna Raybourn, as well as James Rollins, Will Thomas and Blake Crouch, another North Carolina author, have inspired me. Oh man, it’s hard to stop at just a few: John Hart, Johanna Lindsey, Kathleen E. Woodiwiss… I know I’m forgetting a few. I believe my fellow writing friends have been the biggest influences on my writing life. My mentor, Marni Graff, hosted a Writer’s Read for several years which I attended. She took a novice writer and helped her find her voice and encouraged me to self-publish. My fellow HCRW members: Hannah Meredith, Kate Parker, Donna Steele, Reese Ryan, Katharine Ashe and Sabrina Jefferies, as well as PWG members: Kay Wilson, Eileen Lettick, Doris Schneider, Jim Keen, and then there are those I’ve only me online, yours truly, my friends on Facebook and Twitter, and most recently, The New Romance Café on Facebook. I will have a short story in the spring anthology, “Love in Bloom,” which The New Romance Café orchestrated. I have been blessed to have good writers among my intimates. 8. What things would you do differently? What wouldn’t you change? I wish I’d been braver sooner. I hid my stories away not letting anyone read them for years. I wish I’d believed in myself and been willing to take a chance. When I finally let other people read my stories, I began learning what they needed to be better. I believe there is a time and a season for everything. Raising six boys isn’t easy and they needed my attention. My husband, bless his heart, always made sure I had my writing time, he knew it was my therapy. After our house burned down and we lost everything, we went to town to buy necessities and he took me to the book store to buy a book, knowing I’d need it to get me through. I bought Sabrina Jeffries, The Truth About Lord Stoneville. 9. Where do you prefer to write — in a busy coffee shop, or a quiet corner? With six children and nineteen grandchildren, I’ve learned to write anywhere in chunks of 5-10-minute intervals. My biggest problem is I get nosey and want to add my two cents. I do a lot of my writing in the back room at work during lunch and before I open the store, and whenever I get a break. I also have a home office. Sometimes I need quiet, but I can also write in the middle of a hurricane. 10. For all the aspiring writers out there, share some of your best writing advice. Read, write, take writing classes, workshops, connect with other writers, and develop a support group who will read your work and offer real advice. Be brave. I don’t believe you can be a good writer without being a reader. I have seen wonderful writers who never publish because they are not dedicated, and mediocre authors who have gone on to be great because they kept working, trying, and learning. It’s terrifying the first time you share your work with someone or read it aloud for a group, but you will learn so much by sharing your work. Be brave. Enter the contest, write the query letter, submit to everything, just keep trying and eventually you will find your place. With indie publishing on the rise, you can choose to self-publish or go with a small press. There are so many options now that you are only limited by your own fears. Katie: Wonderful advice, Sherri. And you’re absolutely right – there’s nothing scarier than putting yourself and your writing out there to share for the first time, and yet nothing is more rewarding. Thank you for stopping by and sharing such wise and inspiring advice. I raced through Rae Lynn’s story in Chrome Pink, and look forward to reading White Gold and Titanium Blue. Best of luck on your writing journey…and be sure to stop by again the next time you’re in South Florida! 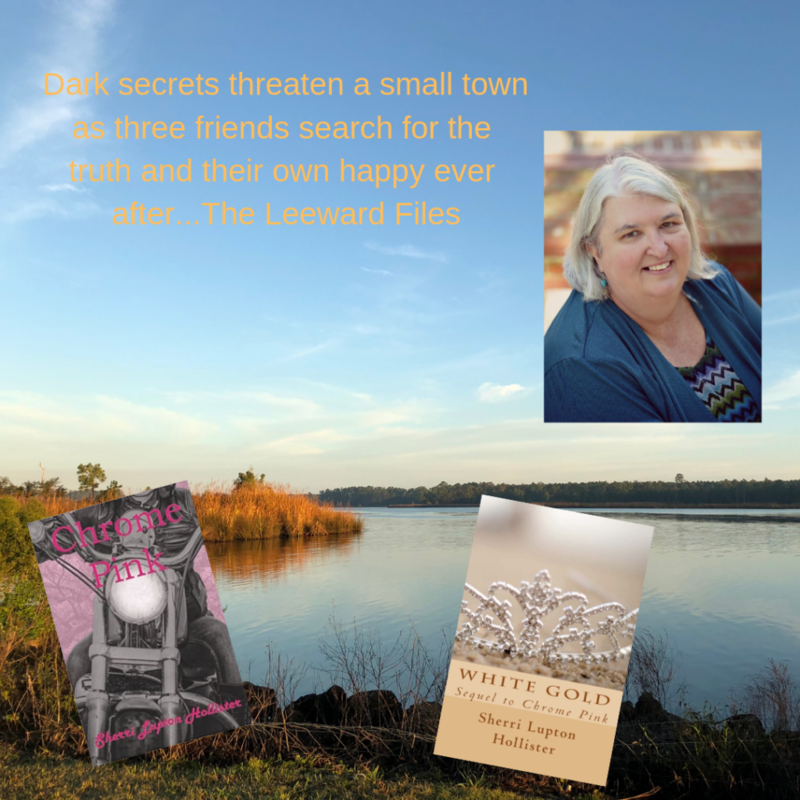 The Leeward Files are set in a small, rural town in North Carolina, similar to Sherri’s hometown. Her characters blend local flavor with her own vivid imagination to create people who could be her friends and neighbors. As a shy, insecure child, Sherri struggled to be heard. Through her stories, she hopes to give a voice to those whose stories need to be told. In writing fiction, Sherri finds the courage to speak the truth. Her characters are often broken but not shattered, flawed but still beautiful, weak but with unplumbed strengths. The Leeward Files—Edge of your seat romantic suspense that will take you on a wild ride through the backroads and byways of North Carolina’s inner banks. Sherri Lupton Hollister – Don’t let your fears defeat your dreams! Want to appear on Ten Q’s With Katie? If you’re a writer, whether published, independent, or aspiring, and you’d like to appear on Ten Q’s With Katie, email me at katieoliverko@gmail.com and let me know. This entry was posted in Romance on February 25, 2019 by Katieoliver.